A woman wrapped in a Nicaragua national flag stands in front of a mural with an anti-government message during a march in support of the Catholic church, in Managua, Nicaragua, Saturday, July 28, 2018. Violence stemming from protests over the past four months has made Nicaragua, once the safest Central American country, now one of the most dangerous. The U.S. on July 6 ordered non-emergency government personnel to leave the country, encouraging citizens to do the same. Nicaragua's President Daniel Ortega accused the Organization of American States (OAS), which is now investigating the unrest, of taking "right-wing measures" against his government and of being directly supported by the U.S. Others have cast the blame back at Ortega. This has been the bloodiest protest in Nicaragua since the civil war ended in 1990 where close to 40,000 people were murdered. So far, 448 people have been killed, according to the Inter-American Commission on Human Rights. Peaceful demonstrations began on April 12 when university students in Managua took the streets to protest the lack of response from the government to wildfires in the Indio Maíz Biological Reserve. The protest grew two days later when thousands joined the students against the government’s intention to cut pensions and social security, a policy that would greatly affect the elderly. Protesters and human rights activists claim people were beaten up by the opposition. During the first days, several people were killed including policemen and many unarmed students. Angel Gahona, a journalist who reported on police abuse and drug trafficking, was killed while livestreaming the protests. Although Ortega canceled the pensions policy a few days later, riots protesting violence and demanding the president’s resignation continued. Ortega, once a leftist icon, is now being compared to Anastacio Somoza, the right-wing dictator he fought against during the Sandinista Revolution. “Ortega y Somoza son la misma cosa” (Ortega and Somoza are the same thing) is the rallying cry. Since the protests began, the government, along with the Sandinista Youth, have been accused of murdering, torturing, jailing and kidnapping hundreds of opponents. While the protests have ceased due to the brutality, the country is in such state of emergency that it is causing Nicaraguans to flee. Ortega has blamed protesters on gangs violently attacking one another. But the United Nations claimed Ortega’s government committed crimes against human rights, including killings, torture and freedom of expression. A few days ago, the Nicaraguan Association for Human Rights closed its offices after receiving what it called “alarming threats.” The group, which has been reporting violence in the country for the past four months, said its workers have experienced death threats over the phone and other sorts of harassment. Once known as “Comandante Daniel,” Daniel Ortega, 72, became first known for his role in the 1979 Sandinista Revolution, when Sandinistas overthrew the right-wing Somoza dynasty that ruled Nicaragua from 1936 to 1979. Since then, Ortega has climbed his way to power. He was elected president in 1984 and after losing elections in the 1990s was elected president again in 2006 following a divided vote. When he took office in 2006, Mr. Ortega, once a Marxist, vowed to be open to foreign investment in the country and sought reconciliation with opponents to fight poverty. Today, he has power over the four branches of the government and is head of the police. His wife, vice-president Rosario Murillo, is known by many as "the power behind the throne." After appointing herself as "communications chief" and leading the role since 2006, she took office as vice-president in January 2017. Ortega was criticized by opponents for establishing an authoritarian dynasty. Murillo's daughter, Zoilamerica Narvaez Murillo, accused Ortega, her stepfather, of sexually harrasing her for many years since she was 11. She tried to pursue legal action, however, Ortega has immunity as member of the Nicaraguan congress. Murillo denied the charges and claimed she was "embarrassed" her own daughter would claim such a thing. Ortega and his wife are compared by many to the Somoza dynasty and are accused of being corrupt, repressive, authoritarian and brutal. Although Murillo and Ortega have blamed the violence on a “diabolic oppression” led by anti-Ortega right-wing groups, two weeks ago, 13 Latin American countries including Argentina, Brazil, Chile, Colombia, Costa Rica, Ecuador, Guatemala, Honduras, Mexico, Panama, Paraguay, Peru and Uruguay, called for immediate end to repression. Additionally, The Inter-American Commission on Human Rights and the Organization of American States are further investigating the unrest. In an interview with journalist Max Blumenthal Ortega said, "what weakens the OEA the most is their revengeful attitude from right-wing Latin governments that have taken over most of Latin America." On July 15, at least 10 were killed throughout the country, including two students trapped overnight inside a church while hiding from gunfire from pro-government supporters. Nicaragua’s Catholic Church had served as a mediator between the government and protesters. The church has since said it supports protesters due to the increasing violence and repression. The opposition, which includes mainly students, clergy, activists, rural workers and business people, has claimed they will keep fighting to remove Ortega from power and attain a true democracy. 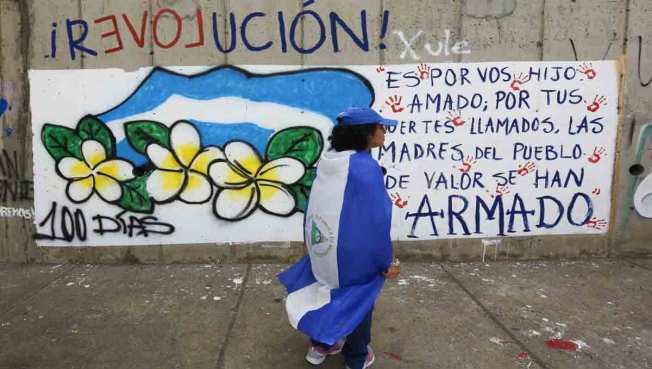 In a recent essay published en El País by Nicaraguan author Sergio Ramírez, he wrote: "It's difficult not to believe that in Nicaragua, history is repeating itself with astonishing, terrifying accuracy."